Admittedly, the prettiest package for our golden amber pure Vermont maple syrup is our glass maple leaf. It captures the spirit of the North Country as the morning sunlight shines through it on the breakfast table. And there's nothing like the intense blueberry flavor of wild Maine blueberries to add even more zest to a stack of buttermilk pancakes drenched in Pure Vermont maple syrup. Put them all together and you have the perfect gift for anyone on your gift list; all at a price that is most attractive too. I buy this for our kids and their families for part of their Christmas present and they love it! It is the best gift for anyone. I purchased this as part of a breakfast basket for my children and grandchildren for Christmas. They all absolutely loved it! It easily fed a family of 5 (2 adults and 3 children) on Christmas morning. Who doesn't like pancakes?! Delicious! The syrup is by far my favorite item in this gift set. It isn't too thick or too sweet, it is just perfect. The pancakes are very tasty with or without the blueberries (which were a a nice touch). Relatives in Hawaii enjoyed this gift! Glass leaf jar was a gift in itself. 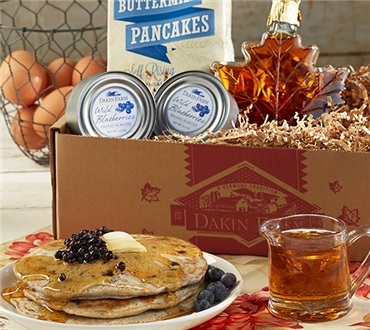 It's hard to be a stack of Dakin Farm blueberry pancakes and warm maple syrup on a cold winter morning in Florida. What a great gift!